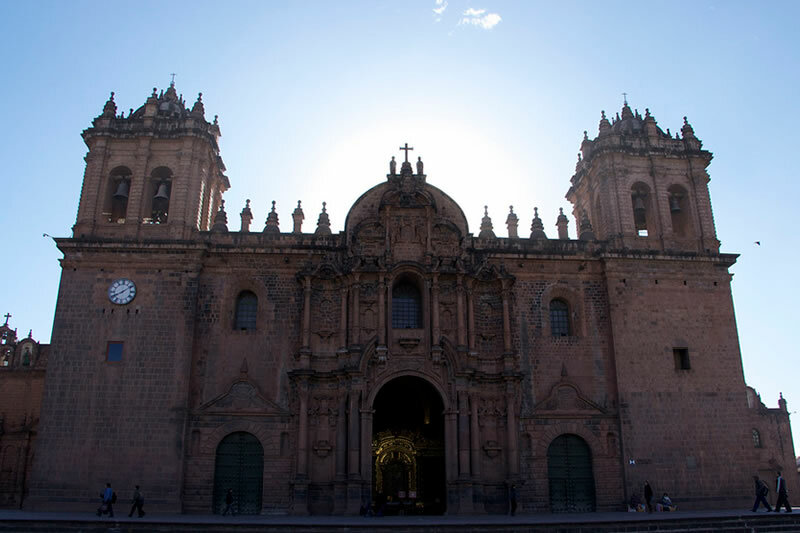 Located in the Plaza de Armas of Cusco, this set of Iglesias, is one of the most beautiful and significant monuments of America. 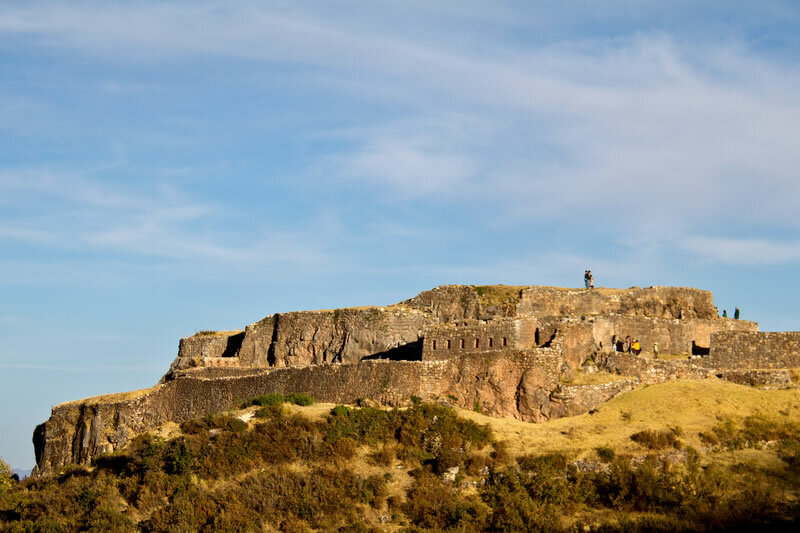 Built during the colonial days, in addition to its imposing presence, the fact that the the foundations belonging to the time of the Incas, and this has been built in the same place where once was located the palace of the Inca Wiracocha. (Sunturwasi), gives an added value, (first temple of Spain in the capital of the Incas). The set of the Cathedral is made up by the Basilica Cathedral of Cusco, Temple de Triomphe and the Temple of the Sagrada Familia. Together these three, occupying a total area of 3,956 m2, is the largest monument in the Historic Center of Cusco. Inside are the best expressions of colonial jewelry, wood carvings of cedar and alder, as the pulpit, as well as a valuable collection of paintings from the Cusquenian School. The accompanying sides two auxiliary chapels, the El Triunfo and the Sagrada Familia. The baroque style present in its great front-altarpiece and its monumental towers. Opening Hours: Monday to Sunday – 10:00 to 18:00 hrs. Entrance Ticket: Religious Circuit Ticket. Adult PEN S/. 25.00, Student PEN S/. 12.50. 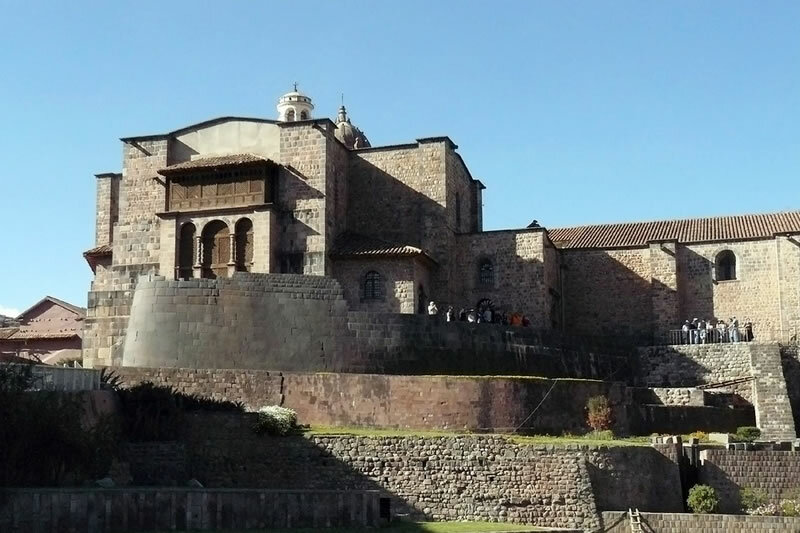 It is also called Temple of the Sun; according to the conception Inca, Qoricancha was the religious, geographical and political center of Cusco. The temple of Qoricancha, where was worshiped the maximum God Inca, the “Inti” (Sun). “Qori” means gold worked and its spanish form is Cori. “Cancha” means enclosed place, bounded by walls. From this it is that the name corresponds roughly is “place fenced that containing gold”. Complex built in the time of the Incas, the main temple during his empire. In this majestic temple, you can still find remains of the walls built by the Spanish at the time of the conquest in an effort to erase evidence of everything that represented the Inca empire. Garcilaso’s description, keeps harmony with what remains standing today. Although this is only a pale reflection of what actually was the Qoricancha in Inca times. In the Coricancha should visit: The Sun Temple, the Temple of the Moon, the Temple of Venus and the Stars, The Temple of Illapa or Chuki Illapa, Temple of K’uychi or Rainbow, Inti Pampa, Solar Garden, The Fuentes. Opening Hours: Monday to Saturday – 08:30 to 17:30 hrs. – Sunday: 14:00 to 17:00 hrs. Entrance Ticket: Sale in the Ticket Office of Qoricancha PEN S/.10.00. Located two kilometers from the city of Cusco, it can be reached by following the north, on a bus, which takes about 15 minutes to reach this archaeological group. From the fortress there is a panoramic view of the entire city of Cusco and environments. 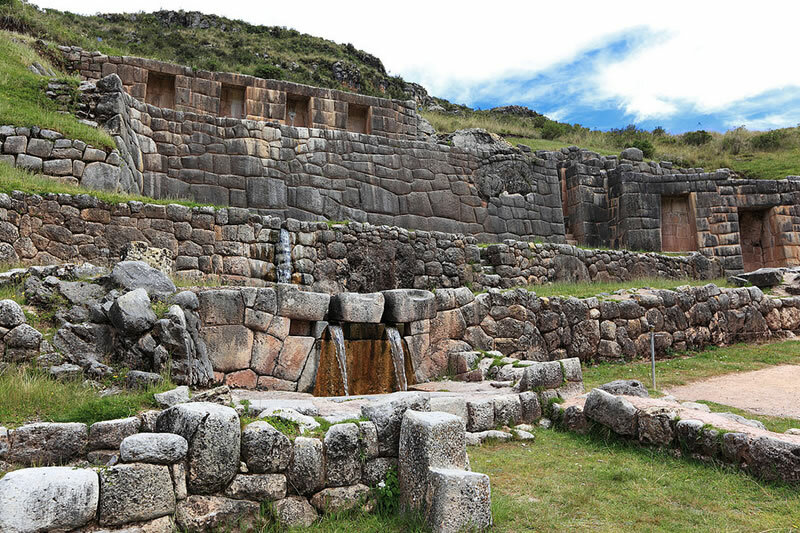 Some authors claim that the construction of Sacsayhuaman started in the government of Inca Pachacutec in the XV century; however, Huayna Capac is responsible for the finishing touches in the sixteenth century. Some believe, by the way it is constructed, it would be a temple dedicated to ray; it has a landscape of great beauty, abundant flora and fauna, among which stand out the flames and the hawks. join the stone walls of the platforms; this work of this magnitude sometimes is difficult to imagine and explain becomes; thus, how do you actually took place?, is another interesting aspect to consider on your visit. 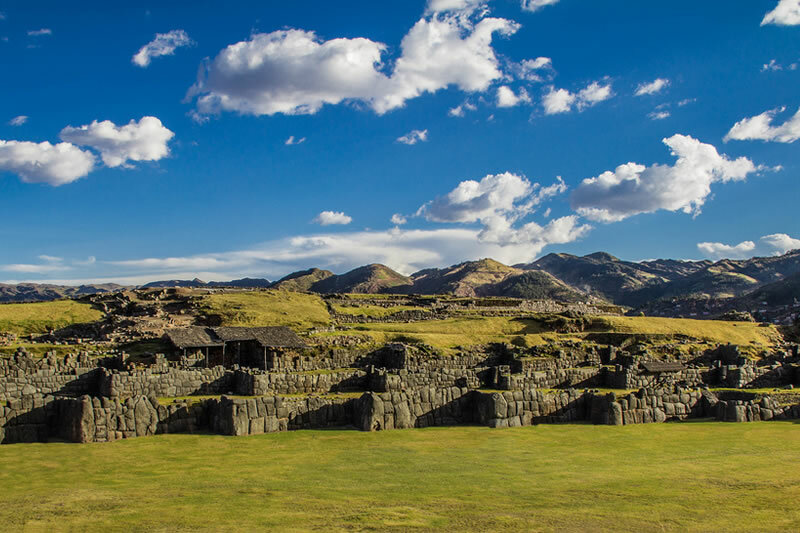 In Sacsayhuaman you should visit the sundial also called Inca Calendar, it is said that this allowed the Incas to know the seasons in order to work properly agriculture, determining the time of planting and harvesting. There are also small and large chincanas, the rodaderos stone turrets and other sites of great historical significance. Opening Hours: Monday to Sunday – 07:00 to 18:00 hrs. Entrance Ticket: General Tourist Ticket or Partial Tourist Ticket Circuit 1. See prices. Located 6 kilometers towards the northeast of the Inca City of Cusco. This shrine is located on what today is called the Socorro hill, its area exceeds 3,500 m2. Of the huacas or sacred places more longest in the city, it is made up of natural rock formations, it is believed that in this place were made many sacrifices and mummification. It is a large rocky outcrop carved with steps, holes and channels, probably made to deposit the chicha (corn drink) consumed in Inca rituals. Formed by a semicircular courtyard well-defined, with several large niches surrounding a stone or waka of little thickness locked in a enclosure, It is a kind of image within its own chapel. With an altitude of 3,580 m.s.n.m. In Qenqo should visit the amphitheater, carved stone, the Intihuatana, the astronomical observatory, Cusilluchayoc, the underground chamber, the zigzagging duct, the mortuary, small Qenqo. Puca Pucara is located east side of the road and one kilometer before reaching Tambomachay. 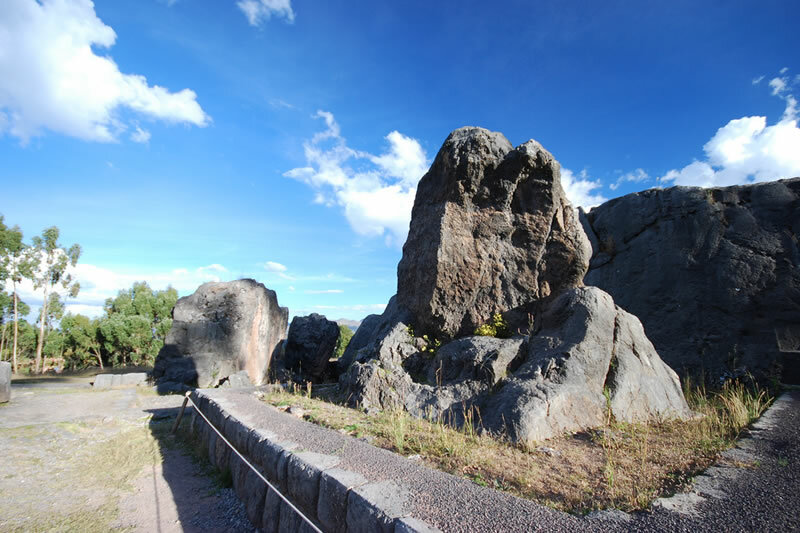 The site occupies another of the typical rocky areas who they excel in the plain of Sacsayhuaman. Puca comes from the Quechua words Puca, “red” and Pucara, “fortress or place defended”. Indeed, the stones become of a reddish color during twilight which would explain its name, but the site seems to have been a fortress. Building of three walls of irregular plant that establish three levels for the site. To the north side, there are six rooms of different sizes, irregularly arranged for not to touch the stones that make up the wall. To the west, has a high trapezoidal square which is entered by a ladder from the outside, surrounded by buildings on two sides, a second wall surrounds the central elevation. There are wide terraces to the south and east. Behind the second wall there are three rooms atypical Inca architecture, since two of them are not rectangular but rather trapezoidal. It is not known for sure what was his role, but the presence of the road to give the impression that it was an inn. It might be, but its plant does not correspond to the standard layout with which these buildings were built. Was it a hunting point of the Incas? Was a settlement for soldiers guarding the Inca on his days off at Tambomachay? The response to the destination and use of this building is still pending. It is located around the city of Cusco, the Inca Empire pillar of defensive system. In its surroundings they are appreciated finely carved natural rock formations, aqueducts and waterfalls provenients from underground springs and nearby hot springs. Tambomachay The name comes from the Quechua words; that translated into Spanish means; Tampu, collective housing and Mach’ay, resting place. However, according to other references, the word “machay” means “caverns”, which describe the peculiar environment of the place where these natural rock formations, are seen, which according to the native tradition, were object of veneration or magical practices. Also we let a fact that is sure to be of your interest, after a visit to the city of Cusco, tour that will allow you to learn more about the history and significance of all these places and then conclude with cherry on the cake, with a visit to the Historic Sanctuary of Machu Picchu; as you may have seen on the internet and social networks, is the classic postcard Machu Picchu, along with all the ruins and the surrounding landscape. But if you do not know how to get this view of Machu Picchu with the structures and the surrounding landscape. Here we let a data, if it is true you have to walk to get it, this road is not long or tired, you do not need to climb any mountain. Just get to the “Casa del Vigilante”, or even before, you can get the best view and postcard that all who visit Machu Picchu must have.